Mexican football player who joined Real Sociedad in 2012 after spending much of his career with Arsenal. In 2018, he signed with Los Angeles FC. He became a part of Mexico's national team in 2007. He began his youth career with Guadalajara at age 13. 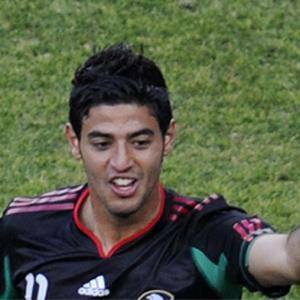 He scored nine goals in 35 appearances with Mexico's national team between 2007 and 2011. His brother Alejandro Vela also became a professional soccer player. He was teammates with French striker Thierry Henry on Arsenal from 2005 to 2007.